General Disclaimer: The stock discussed here is not a recommendation or advisory. This is a quick analysis and there might be much additional information that you need to refer to study the company completely. This case study is only for the educational purpose to teach the practical approach while investigating stocks. Besides, the past performance doesn’t guarantee the future returns. 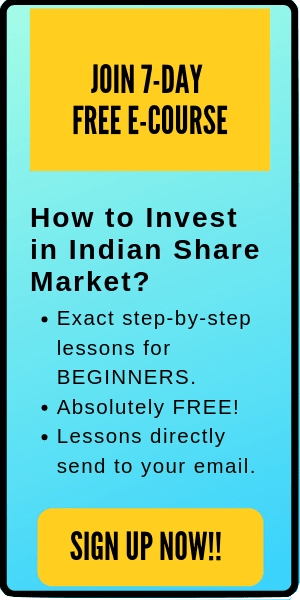 Please research the stock carefully before investing or take the help of a financial advisor. Pidilite Industries is a popular consumer-centric company whose products you might have already frequently used- knowingly or unknowingly. They are the leaders in the adhesive industry and focuses on ease-of-use and value-for-money products. Few of the popular products of Pidilite Industries are Fevicol Mr, Dr. Fixit, Fevikwik, M-seal, Fevistik, Hobby Ideas, Fevicryl etc. The company started with a single factory that manufactured only one product, Fevicol in 1959. As of today, Pidilite has a diversified product portfolio from adhesives, sealants, waterproofing solutions and construction chemicals to arts & crafts, industrial resins, polymers and more. 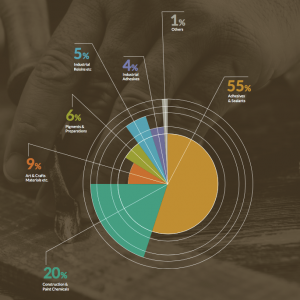 As of 2017-18, Pidilite Industries’ top product portfolio consists of 55% in adhesive and sealants, 20% in construction and paint chemicals and 9% in art and craft materials. If we look at the financials, Pidilite is a financially strong company. 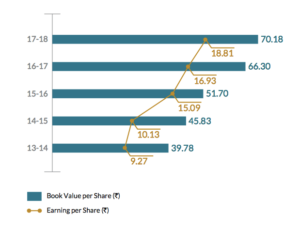 Here’s the EPS and book value per share growth trend for the last 5 years (EPS has more than doubled in the last five years). Next, If we look at the profit before tax (PBT) and PBT as % of net sales (margin), both are showing a positive trend. 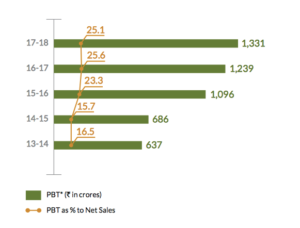 PBT has also doubled itself in the last five years. Further, Pidilite industries is a completely debt-free company for many years. 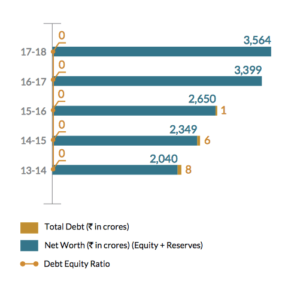 Here’s the debt to equity ratio of Pidilite from 2013-14 to 2017-18. 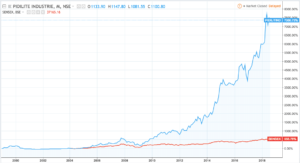 If we look closely at the last 10 years financial performance of Pidilite industries, we can find a healthy growth trend in sales, operating profit, net profit, and dividends. The sales and other income of Pidilite Industries has been growing at a compounded annual growth rate (CAGR) of 12.62% for the last 10 years. Besides, the net profit after tax is consistently growing at a splendid CAGR of 23.17% in the same time period. Here is a quick snapshot of the financial performance of Pidilite Industries for the last 10 years. Valuation: Pidilite Industries is currently trading at a consolidated PE of 57.36 which is a little high. This may be because of its high growth compared to its industry and competitors, that’s why people might be willing to purchase this stock at a premium. You can learn more about the valuation of stocks on my online course here. Dividends: Along with growth, Pidilite Industries has also been rewarding its shareholders with healthy dividends per share year-after-year. The company has been maintaining an excellent average dividend payout ratio of 34.74% for the last 5 years. Moreover, the significant point here is a steadily growing dividend over time. Pidilite is a dominant player in India’s adhesive industry with a market share of ~70% in its leading brand categories (Fevicol,) in the organized segment. Few of the competitors of Pidilite Industries are Tata Chemicals, BASF, BOC India etc. Market leaders in adhesives, sealants, polymer emulsions, hobby colors and construction chemicals in India. Strong R&D center to cater growth and innovations. 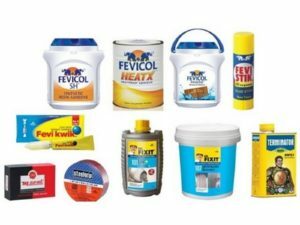 Although Pidilite Industries has a strong competitive advantage, however, there are few concerns like over-dependence on Fevicol and M-seal (which alone account for over 50% of the total revenue of Pidilite). This eases the pressure on the sales of other brands and results in reduced investment in other businesses. There’s no doubt that Pidilite industries has performed well in that past few decades. And it clearly reflects in its share price. Pidilite has created a wealth of over 1,600% for its shareholders in the last 10 years. Here’s a comparison of Pidilite Industries returns vs BSE benchmark index SENSEX. From the above analysis, we can conclude that Pidilite Industries in a financially and fundamentally strong company with good ‘moat’ around it. However, there are a few other aspects that we also need to check before making any investment decision like the company’s management, shareholding pattern, mutual funds holdings, future outlooks etc. For keeping this post simple, I’ve only included a limited study here. Nevertheless, I’ll discuss the remaining aspects in upcoming posts. Anyways, I believe you would have got a good idea of how to study companies while researching and critical factors to check -through this short analysis. Final tip- The company’s annual report is the best place to start investigating a stock. If you have noticed, most of the data in this post has been collected from the company’s report. 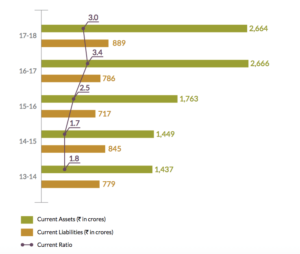 In addition, these reports are more reliable than most financial websites as the company’s annual reports go through a strict scrutiny and audit by both independent auditors and SEBI. 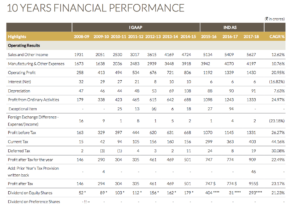 In short, start reading the annual reports of the companies. That’s all for this post. I hope this post is useful to you. 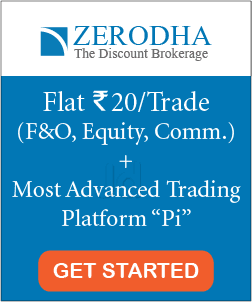 And if you ready, take the #TradeBrainsChallenge- Invest Rs 5,000 in a month. #HappyInvesting.